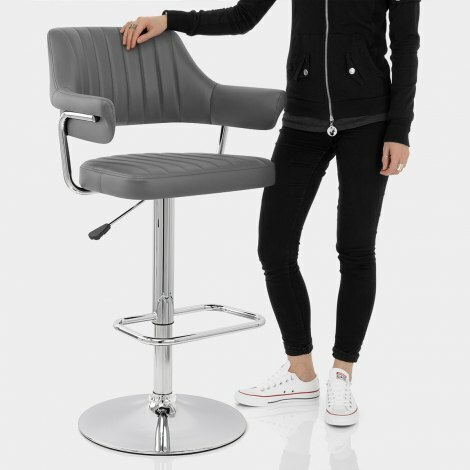 The Skyline Bar Chair Grey is a real retro design with a fresh and modern look that is truly impressive. A fashionable pairing of the past and the present, the Skyline is designed with comfort and style in mind, making it a timeless piece for the home and beyond. Stunning grey faux leather covers the seat and backrest, and the vertical stitch detail adds an exclusive feel to the design. 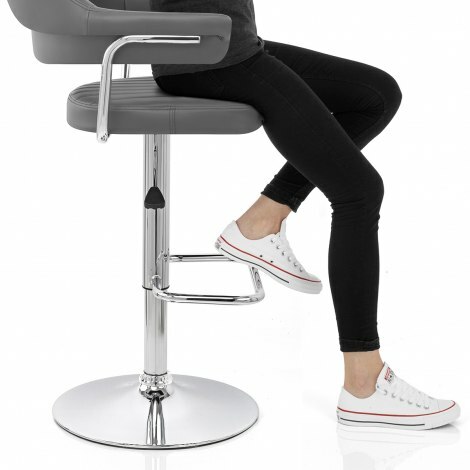 This stool is as comfortable as it is stylish thanks to the dense padding throughout. 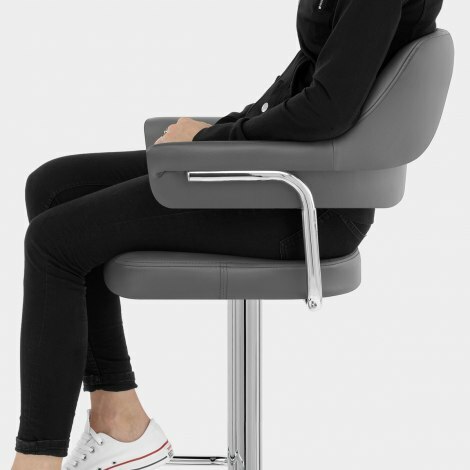 Held upright by two chrome supports, the elevated backrest curves to create two armrests for extra support. Plus, the chrome framework below has a variable height gas lift and 360-swivel feature. A rectangular footrest and domed base complete the look, finished with a rubber guard underneath to protect your floor surfaces. "Everyone is remarking on how nice and comfy they are"
We bought this stool for the office upstairs to go with our tall desk. It was extremely easy to assemble and has been brilliant. The chair part is so comfortable. The delivery was super fast too. We love it, thank you Atlantic Shopping. Arrived promptly nice stool good value. The quality of this stool is fantastic, looks exactly as in image. Really pleased with these stools. The grey is a lovely shade . Bought 3 of them and will be adding the white version of them to my collection. Very comfortable to sit on with the added comfort of the arm rests. The company was a dream to deal with and gave me a phonecall to clarify order. Very pleased with this purchase. I have had it for a few days so far, it's great. The quality is great the delivery time amazing. I can't say anything other then many thanks.